Two weeks ago, I attended a dinner event held by one of my networking organizations. The speaker for the evening was Dr. Lori Gaskin, the new president of Santa Barbara City College. 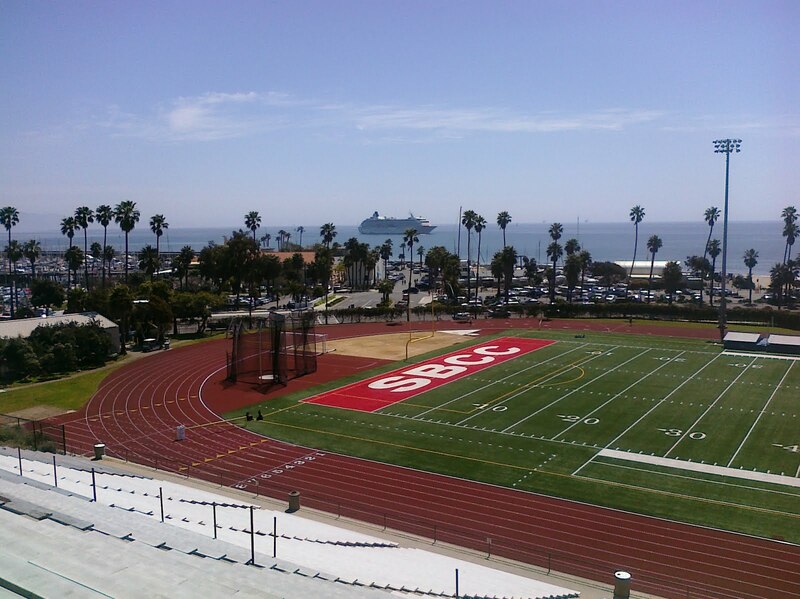 There's been a lot of turmoil over the past couple of years at SBCC, and our community has been hoping for positive changes in conjunction with the change in leadership, so this was a great opportunity to hear what's been going on at City College -- and hopefully not just a sales pitch. 1. Dr. Gaskin started off the evening by networking her way around the room, introducing herself to the members of the group. Making friends with the audience and building a connection before you speak is such a simple tool for reducing speaking anxiety and getting comfortable with the room, but few speakers (besides politicians) think to do this. 2. To begin her presentation, she started by pairing off audience members and handing out a quiz. This is one of my all-time favorite activities, and again, I rarely see speakers engaging the audience at this level. It helps that she's a former teacher and easily applies teaching concepts to her talk, but it's not that hard for the average speaker to be a little more creative with engagement activities. 3. She gave the quiz up front, but instead of giving the answers all at once, seeded answers throughout the presentation, motivating the audience to retain more focus as we listened and watched to see if we would get the answers correct (and win a prize!). I'll tell you right now that, as a Santa Barbara native, I should have done much better on the quiz! 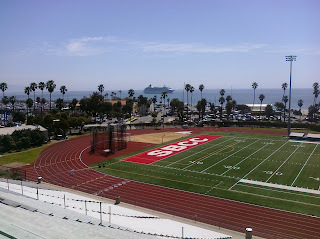 Including the question about how many steps there are in the SBCC stadium. How many times have I told you about my workouts and posted pictures here of those very stairs... that are numbered? Well, I was off by 2. Darn it! 4. Dr. Gaskin not only took an interactive approach with the audience, but also made sure her facts and statistics were meaningful to the audience. Her slides were simple and clean, and unlike speakers who try to tell you everything about everything in a limited amount of time, she focused on the points she thought would actually interest the audience. The level of detail was interesting and appropriate, not overwhelming or mind-numbing. What a concept! 5. She told stories and expressed the achievements of SBCC and its students with authentic passion and enthusiasm. She is clearly inspired by her work, by the college and by our community, which was endearing to a local like me. I meet fewer and fewer people my age who were born here; it's not easy to stay in Santa Barbara if you want to live here without struggling financially, and especially if you want to own a home. And the people who move here from other cities and states are often not as invested in the culture as the locals (although some are probably more invested -- particularly those who are raising children here). So I was pleasantly surprised to meet Dr. Gaskin and to hear not only of the amazing successes happening at City College, but also of her rapidly growing affection for the students, faculty and staff, and for the Santa Barbara community. It was one of the most enjoyable presentations I have attended in a long time. Informative, educational, fun, and inspiring. Not the kind of presentation I see every day, but the kind of presentation I help my clients aspire to! Welcome to Santa Barbara, Dr. Gaskin!